•The city of Carson would receive $1,323,300 in local return funds in Measure M’s first year. Local return funds are a percentage of the sales tax revenues that are returned to cities on a per capita basis to pay for local projects such as street repair, traffic light synchronizations, transit and pedestrian and biking infrastructure. •There would be $250 million for improvements to the 405/110 interchange. The project would add ramps that directly connect HOV lanes on the 110 and 405. •The I-405 South Bay Curve Improvements project would receive $150 million. This project would add segments of auxiliary lanes in both directions to improve traffic flow at on- and off-ramps for 10 miles between Florence Avenue and the 110 freeway. •The 710 South Corridor Project would adds two zero-emission truck lanes in each direction between Long Beach and Commerce for a total of 18 miles while maintaining current general purpose lanes. The project includes improvements to the Shoemaker Bridge and would receive $500 million from Measure M. The project’s estimated total cost is $1.3 billion. •The Green Line Extension to Crenshaw Boulevard in nearby Torrance. The Green Line would be extended for 4.7 miles from its current terminus in Redondo Beach to a new Torrance Transit Center. The opening date would be 2030-32. •There would be funding for a new light rail station adjacent to LAX where Green Line and Crenshaw/LAX Line riders will be able to transfer to a people mover — to be built by LAX — that will serve airport terminals. The station would open in 2021-23 with the people mover targeted to open by 2023. •Carson is part of Metro’s South Bay subregion. 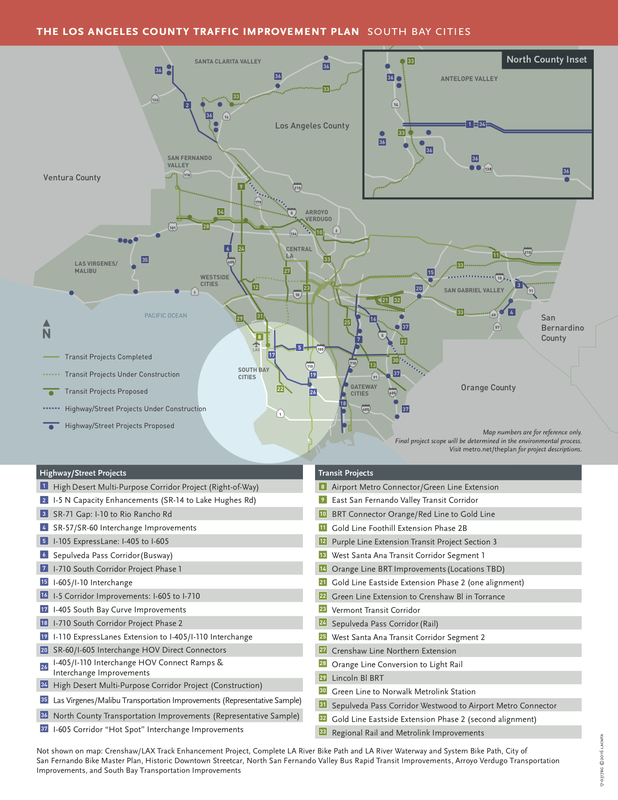 There is also funding in Measure M for other programs such as South Bay Highway Operational Improvements ($500 million of $1.1 billion total cost); Transportation System and Mobility Improvements Program ($643.5 million); Subregional Equity Program ($130 million), and; all subregions are eligible to compete for $260 million ($350 million total cost) worth of Bus Rapid Transit projects, and $858 million worth of Metro Active Transportation Projects. •Metro Transit in South Bay Cities will also receive additional funding.